Do you love disco music and you are looking for a themed web radio? You landed in the right place, because Radio Today Dance Classic is Disco Dance Radio that offers you the best disco hits from 1970 to 2010, carefully selected and ready to be listened to and danced at any time of the day. We can assure you: we love disco music so much to offer you a unique selection, which comes from our experience in the radio universe, which began in 1976 and has grown over the years. The disco music that you can find here, directly in streaming, is the daughter of the authentic Passion and of the Professionalism we have available, the result of years in the field of the speaker and of radio activities. After all, a good few years have passed (more than 40!) Since the birth of the first broadcasters, in the course of which these realities have evolved, becoming web radio, syndication and, in some cases, important radio networks. Radio Today Dance Classic collects the music and rhythms you love and search into a single disco radio, so that they become your musical reference point when you want to dance, listen and enjoy your favorite sound at any time of the day! The disco music, or disco, was born in the '70s from different musical genres, especially from funky and soul. This was his golden age, especially towards the end of the decade, when a fervent musical scene linked to the genre was born in most of the cities of the States. A name for all, the legendary Studio54, which was the temple of disco music at the time and a reference for lovers of the genre. But disco music had an overwhelming success also because it was played by radio, it was popular in the full sense of the term, loved and sought after for its rhythms and not only to be danced, but also heard at different times from the night. And the musical revolution began in the disco from 1970, with DJs remixing existing songs using tape recorders, creating new sounds and new sections thanks to the break in the percussions, but above all by selecting songs and grooves for the happiness of the night people. The DJs of the '70s and' 80s were great experimenters and precursors of current rhythms, because they worked from one track to another with the mixers, introducing the songs with the microphone and manipulating the sound in real time, thanks to instruments that allowed to realize echoes, reverbs and equalizations. Spells applied to disco music, which have left their mark and that today you have the chance to rediscover in a dance radio disco totally dedicated to this genre. And finally here are the names of the artists who have made the panorama of international disco music great. The dance '70 has seen shining names such as Donna Summer (unforgettable her I Feel Love), KC and The Sunshine Band, Giorgio Moroder, the Bee Gees, the Jackson 5, The Trammps (their first hit Disco Music, Disco Inferno of 1976), Labelles, Barry White, Electric Light Orchestra, Van McCoy, Silver Convention, John Paul Young and Jimmy Bo Horne. And again the Chic with Neil Rodgers and his destiny as a great music producer, Gloria Gaynor, Andy Gibb, Village People, Sylvester, Patrick Hernandez, Sister Sledge, Earth Wind and Fire, Anita Ward, Ami Steward, Kool & The Gang. These are just some emblematic names, which tell a fairytale disco scenario, where the artists of the time have launched hits able to climb the charts all over the world and have definitely left their mark, making millions of people dance to the rhythm of the great disco music. And the same pace you can find out today, thanks to the disco dance radio that gives you exciting moments, which makes you relive the music scene of those years directly in streaming: welcome to Radio Today Dance Classic, It's Disco Time! 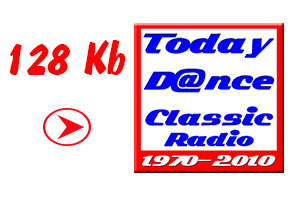 Listen to streaming for free by connecting to our web radio page, take advantage of the music proposals of 1970 thru 2010 Today Dance Classic Radio, or if you prefer to listen and dance the hits of dance music from 2010 to today listen Today Dance Radio. You can take advantage of our web tv proposal, you can watch our tv music videos, visit Today Dance TV. (you will be directed to the TV website). Are you looking for Disco Dance Radio for your club or business? If you love disco music and are looking for an effective radio for your local, your business or your shop Radio Today Dance Classic is the web radio that's right for you, to offer your customers an enveloping musical experience, from listen and dance to make your environment unique to the rhythm of the best disco music.